The kindergarten students in the Cahal class at HANC have been learning about winter weather, which means snow and ice. Unfortunately (from a five-year-old’s perspective at least), we had not had any yet. However, that has not deterred them from the learning and experiments that go on in the classroom. The children know that both rain and temperature below 32 degrees must come together to form snow, so until that happens they have made snow pictures from white paint and sponge brushes, made papercut snowflakes, and ate a snow cake that they baked. 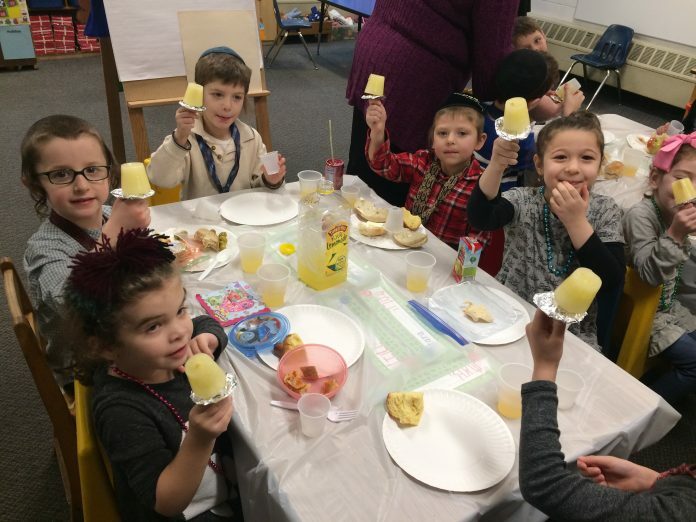 Liquids turn into solid ice from the freezing cold, so they made liquid lemonade into solid lemon ice pops that dripped back into luscious liquid when they licked them with their tongues. They also made all shapes of blue ice cubes and had fun popping them in and out of the molds like puzzle pieces. The children were so excited to welcome 12 of the sixth-grade girls to partner with them in completing a page in their science journals. Teaming up to look through magazines, they cut out pictures of objects that are solids and liquids and glued them into the appropriate categories on their page. So many interactive and hands-on activities have brought the winter weather unit to life and into the classroom for the students to enjoy.